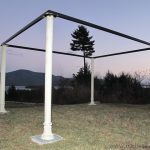 Pergola – 100-Year-old cast steel posts are reclaimed from a building tear down in Albany NY. The posts were reworked to have clamps and brackets for a roof system and anchored to concrete. 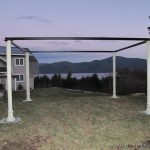 Installed in Bolton Landing, NY.